Abu Dhabi: Sharjah FC took top honours at the most diverse youth football tournament in the Middle East as it drew to a dramatic conclusion in Abu Dhabi. 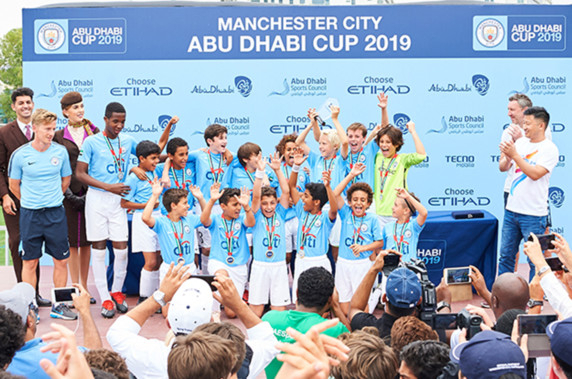 Of the 130 teams that participated, six teams were victorious in their respective age-group finals at the Manchester City Abu Dhabi Cup. The winners were: Manchester City Academy in the Under-8s, City Football Schools Abu Dhabi in the U10s, City Football Schools Abu Dhabi in the U12s, Melbourne City Academy in the U14s, Sharjah FC in the U16s, and Abu Dhabi Thistle won the girls’ U14s age group. The six trophy-winning teams will get a special coaching session from Manchester City club coaches, with Sharjah being drawn at random from the winners for the special prize of a trip-of-a-lifetime to the Etihad Campus, the home of Manchester City. Speaking about their win, the coach of Sharjah, Daniel Petru Huza, said: “It’s incredible and I feel emotional. I can’t wait to travel to Manchester to see what it’s all about as I heard it’s a fantastic academy facility — we feel super lucky for this opportunity.